The night before we were to leave for London I could hardly sleep. I had researched online about the area we would be staying. It was a small town called Kew, which is a borough of London, and also where the National Archives sits. Both of these places intrigued me. What Kathy and I would be researching at the National Archives in Kew, England. The National Archives holds information that is over 1000 years old. 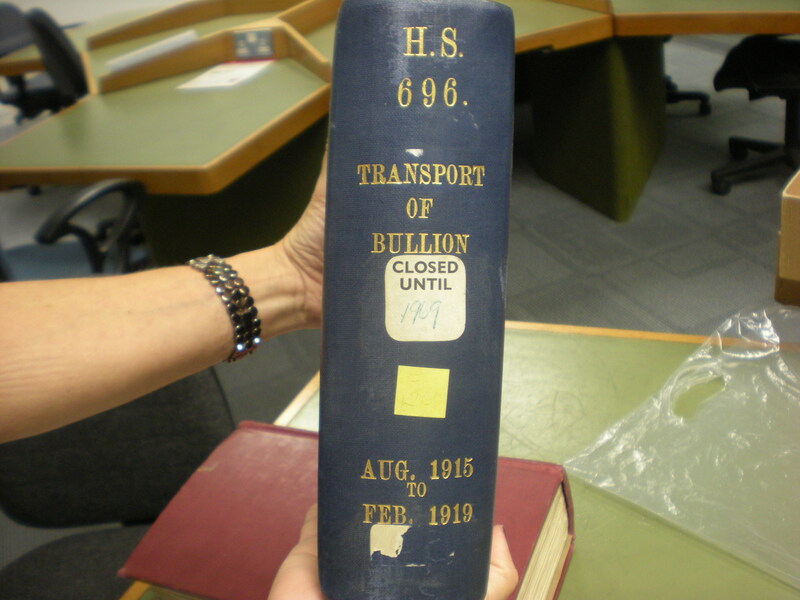 We would be researching the transporting of bullion during WWII. Kathy had already informed them of our coming as they require you get a “readers card” to request certain documents. In order to get a readers card you must show two forms of identification. You can also order the documents you want ahead of time so they will be waiting when you arrive. They have some very specific rules. You could only bring in a graphite pencil with no eraser attached. No pens or markers allowed. You are allowed to bring a digital camera, but no flash. And of course, no food or drink was allowed anywhere except in the cafe. I’ve always loved books and reading so knowing that I would be sitting among all this information was just so exciting. The town of Kew sounded fascinating. Its home to the famous Kew Gardens, which is known for being a world leader in plant science and conservation. It has over 100,000 different species of plants in over 300 acres. The village of Kew was formed in the 18th century and people still play cricket in the square. The idea of actually being in a place with so much history was intriguing. Of course, visiting and shopping in London has always been a dream of mine. There were endless places to experience throughout London. Though I knew we were there to do a job, and that was exciting in itself, both Kathy and I planned to do as much sightseeing as possible. Our hotel reservations however, had a bit of a glitch. The hotel we originally chose, Kew Garden Hotel was within walking distance to the National Achieves. It was listed as a boutique hotel with only 19 rooms that were based above their pub. It was situated in the heart of Kew Village. However, they could only accommodate us for the first two nights and the last couple of nights. That meant we had to find somewhere else for the middle of the week. Kathy found another hotel, Coach and Horses that was a bit further but still within walking distance. After reviewing this hotel, I was excited to stay there and spend some time. It was one of three original hotels in the village of Kew, dating back to the 18th century. Only recently have they done some remodeling to upgrade. It has 31 rooms above, of course, a pub. Most pubs in the UK are nothing like American bars. They are places where all age groups can go, from babies to old men and women. They gather to eat, drink, tell stories and of course sing. I’ve heard it compared to “sitting in your grandmothers living room”. We also made plans to visit with the two cameramen from The Discovery channel, which had been on our ship all summer. It had been about six weeks since Martin and Toryn had returned home to England. I had spent a lot of time with them aboard our ship, the M/V Sea Hunter and we had developed a close friendship. We even celebrated Martin’s 60th birthday on the ship with a cake brought by Kathy. It would be wonderful to see them again and visit on their side of the pond. The plan was made for Toryn to pick us up late one afternoon and drive the hour and a half into the countryside of Fordcombe, Kent. This is where Martin, his wife Claire, and their three sons lived. Their home was named, Chafford Park Cottage. As I drifted off to sleep, I thought about all the new and exciting places I would see in the UK. I would visit the city of London, the small village of Kew, and a countryside cottage in Fordcombe. I knew this would be one of the best experiences of my life and I couldn’t wait for morning to come.